At the turn of the century, Downtown’s Main Street was the most prestigious address in the city. But sadly, by the 90s it had deteriorated into a glorified bus corridor where the streets were deplorable, the pedestrian experience was non-existent, retail had fled, and abandoned buildings abound. Something needed to change. For decades, the idea of bringing fixed transit, or light rail, was zealously debated from City Hall to office water coolers. 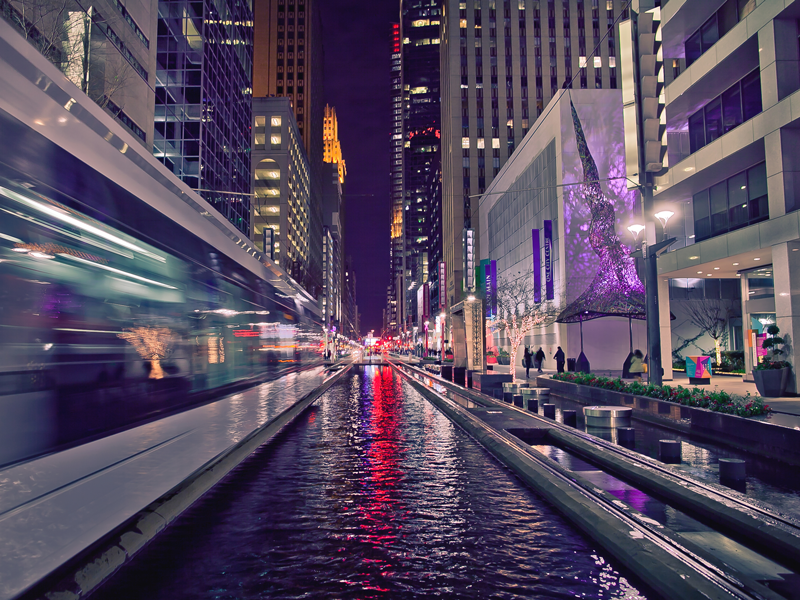 Proponents argued rail would better link key activity centers such as Downtown and the Texas Medical Center and help show Houston was serious about addressing its traffic issues. Detractors feared people wouldn’t use the line and that such a project would actually deter development on one of the city’s vital corridors. As discussions progressed, it became clear among supportive constituencies along Main Street that they needed to work together if they wanted to see rail built and ensure its success. With urging from Mayor Lee Brown, groups such as Central Houston, the South Main Alliance, Texas Medical Center, Rice University, NRG Park, Houston Livestock Show & Rodeo and others formed the Main Street Coalition, a collaborative body that would use its collective force to advocate for the future of the street. Led by longtime real estate authority Ed Wulfe, the coalition helped overcome lawsuits against the rail line and saw construction begin in 2001. Released in 2000, the coalition and city’s vision plan for Main Street painted a picture of a vibrant urban corridor where pedestrians, mass transit, business, retail, residential and public uses melded. The arrival of rail, the study argued, created enormous opportunities to transform Main into a world-class boulevard if public entities took the right steps to encourage private investment. 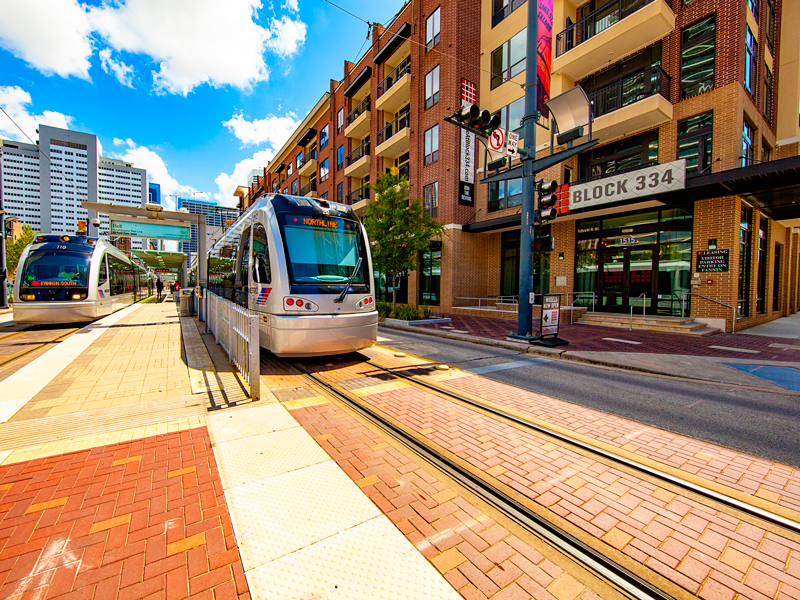 Another report by the Urban Land Institute cited case studies from cities such as Dallas and Denver that showed how rail had improved entire neighborhoods and brought in new money. Among the recommendations called for in the study were enhanced sidewalks and other pedestrian streetscape improvements, new design guidelines encouraging ground level retail and cafes, and support for high density mixed-use developments at rail stops that would include residential units. The report predicted $1.6 billion in new investment was possible if such policies were adopted. It was a vision far removed from the reality of the time. Prior to rail construction, many properties along Main in Downtown sat vacant or underused. The street was an almost impossible place to set up shop since the city had instituted no-turn traffic policies designed to accommodate a nearly constant flow of buses. Vagrancy was rampant. In Midtown, vast swaths of the neighborhood remained derelict, hampered by underutilized real estate and crime. To the south, the Museum District was faring somewhat better thanks to a growing number of institutions and the stabilizing presence of Rice University. Meanwhile the area surrounding the Astrodome was a concrete expanse with little by way of aesthetics or a sense of place. “When the Main Street Coalition started, the corridor was a patchwork of highly developed areas connected by stretches of urban blight,” says Susan Young, board member and former president of the South Main Alliance, which encompasses 12 square miles along Main from Midtown to NRG Park. The study was a start, but the vision continued to evolve. Civic leader and architect Peter Brown played a critical role in the transformed Main Street. He and others toured Europe looking at the grand boulevards in major cities for inspiration. Ideas for public squares along the corridor as well as a more modernistic look for Metro’s rail trains came out of these excursions, though the latter took some convincing of Metro officials. The coalition also helped the city go after federal funds to make improvements, something that might not have happened without cooperation. One specific effort involved planting 600 live oak trees along South Main, setting the tone for that segment of the street and reinforcing the new concept of a “park” surrounding the Astrodome and the new stadium ahead of the 2004 Super Bowl. At the same time, pressure and threats from various forces to stop rail construction galvanized the coalition and Metro and prompted one of the most expansive construction projects in the city’s history. Instead of doing it in sections, Main Street was torn up from Downtown to the Med Center. The deadline of an approaching Super Bowl certainly played a role—but the focus was on ensuring the project couldn’t be halted. In the last 15 years, more than $2.2 billion in new projects have been constructed along Main in Downtown alone. Factoring in developments in Midtown, the Museum District, Texas Medical Center and NRG Park, that figure more than doubles—significantly more than the $1.6 billion the ULI report predicted. “The vitality of Main today has been years in the making,” says Eury. In the late 90s and early 2000s, a flurry of developments, propelled by the transit project on Main, opened. Catalytic projects such as The Rice, a high-profile residential conversion of the historic Rice Hotel on Main and Texas by developer Randall Davis, and Downtown’s first office tower in decades, Richard Everett’s 1000 Main, paved the way followed by a dozen more projects. In addition, a signature plaza, Main Street Square, was opened integrating light rail transit, including two station platforms with landscaping and a feature foundation, and renewed pedestrian activity. 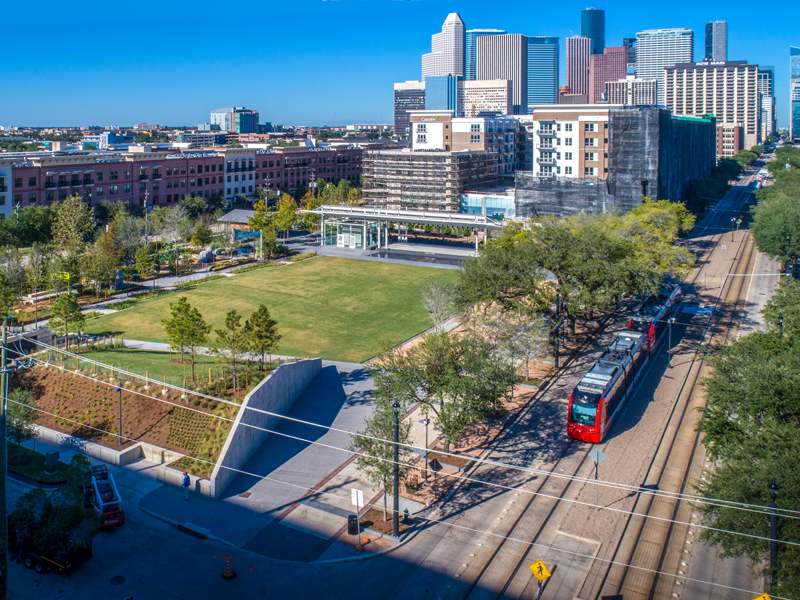 Transitioning Downtown from an office-only district to a place people would want to gather and reside has taken time, spurred in part by development projects such as Discovery Green and Buffalo Bayou Park. Similarly, in Midtown, pioneering projects such as Post Properties’ mixed-use development at Bagby and West Gray showed the city was becoming interested in mixed-use, urban living. The neighborhoods would, in fact, mature around the rail line and the aesthetic improvements that individual management districts made on Main. Houston-based real estate development company Hines has a long history creating projects in its own backyard. Mark Cover, CEO of the company’s southwest region, says after years of Downtown “donating” growing companies to the suburbs, he’s seen a reversal as a more dynamic district draws and retains office users and residents. Hines purchased two of the most blighted blocks on Main Street. Starting with the east side of the 800-block of Main, the company built the 46-story office tower now known as BG Group Place in 2009. That helped spur neighboring projects like the JW Marriott Downtown and prompted Hines to continue the strategy with 609 Main, completed last year. “These connections between the west and east sides of Downtown are critical, and that’s why Main Street is so important,” Cover says. Hines’ new projects certainly contributed to a healthier office market along Main. A study released last year by Jones Lang Lasalle ranked the Downtown portion of the street among the most expensive office corridors in the country. With an average full-service rent of $44.24 per square foot, or 45 percent above the rest of the market, Main has become a highly desirable corporate address. But Hines didn’t want to stop there. Hines is among many developers in recent years to take advantage of the Downtown Living Initiative, a program of the City of Houston, Downtown District and Downtown Redevelopment Authority/TIRZ #3 to provide financial incentives to those constructing multifamily projects. So far, nine mid- and high-rise projects have been built under the initiative, with more in the pipeline. Many of those developments have been built on Main or within a block or two, such as SkyHouse Houston, SkyHouse Main and Block 334, now creating critical mass and forming a new, up-and-coming Southern Downtown neighborhood. Completed last year, Hines’ 32-story Aris project brought 274 residential units to the corner of Travis and Preston in the Historic Market Square neighborhood located in the northern end of Downtown. The project includes a small pocket park with direct access to Main Street. Cover says there’s a new desire for urban living in Houston as more residents lose their love affair with their cars. “People today want to be more neighborhood focused, they want to play, dine, shop and live within a reasonable radius.” The positive reception of Aris has Hines planning its next Downtown multifamily project. The residential population of Downtown is expected to grow from 7,500 to 30,000 over the next 20 years. Projects already in the works will move the count past 10,000 in just the next few years. In Midtown, the early success of Post Midtown Square has led to more mixed-use projects as that neighborhood matured. Marlon Marshall, director of engineering and construction for the Midtown Redevelopment Authority, says the group’s capital improvement projects along Main, including the recently opened Midtown Park and the Main Street Streetscape, have encouraged new private development, particularly near rail stops. The recently opened Mid-Main Lofts at the HCC/Ensemble Station features numerous retail and restaurant spaces fronting Main Street with hundreds of apartments above. In November, Caydon Property Group broke ground on a $200 million high-rise residential tower steps from the McGowen Station, just as Camden Property Trust wraps up construction on its $90 million, 315-unit Camden McGowen Station apartment project. As urban multifamily projects are completed in Downtown and Midtown, Wulfe believes the Museum District will be the next area to see a surge in such development. Already projects like the 20-story The Carter apartment tower are transforming the landscape. “It’s a very desirable place to live and work, and I think that’s going to be the next stage of development,” he says. But as Main’s evolution continues, can it remain a street that serves the needs of everyone? Eury points out that high land prices in Downtown make it difficult for developers to recoup their investment with lower priced units. But he believes there are segments elsewhere along the rail line that could be developed as more affordable housing. The city could also step in and incentivize developers to provide a percentage of their total project at below market rate. The challenge for any new development is to create value without changing the fabric of a community. “How do we ensure that the culture and history of these neighborhoods remains intact?” says Wulfe. While gentrification and affordability do not often work together, he says, reaching consensus is in everyone’s best interest. At the same time, new residents, office workers and hotel guests need something else that’s been hard to come by on Main Street—a place to shop. Once a hub for department stores and other soft goods retail, Main saw most of these evaporate in the second half of the 20th century. The 2013 closure of Macy’s left Downtown with no major retailers, while projects such as GreenStreet seeking to reintroduce shopping have met with mixed results. The Downtown District has campaigned for years to get more retail in the district, but most of the success in that arena has centered on restaurants and nightlife, not clothiers and accessory boutiques. More street-level restaurants and retail experiences are going to be key to connecting existing nodes of activity in Downtown and Midtown in the future. Despite an improving Main Street and high-traffic pedestrian zones like Historic Market Square and the new Avenida Houston near the Convention Center, walking from one side of Downtown to the other can still seem daunting with blocks of uninviting parking garages or high-rise facades. One of the methods of connecting dense, urban landscapes served by rail is Transit Oriented Developments (TODs), a central tenet of the 2002 ULI plan. Such projects are designed to alleviate the need for vehicles and to incentivize residents to eat, work, shop and play within a smaller footprint. 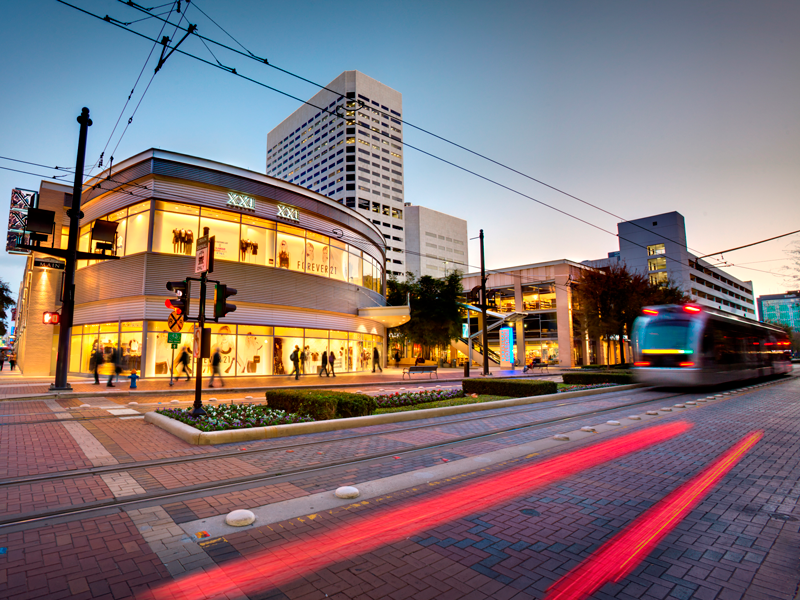 Yet despite some successes like those already developed and in the pipeline in Midtown, TODs have proven difficult to come by along Houston’s rail system, which now runs more than 22 miles following the opening of new lines in 2016. Wulfe says putting together mixed-use developments is often riddled with bureaucracy. Current ordinances governing development in most parts of the city require a certain amount of parking, setbacks and other elements that make high density nearly untenable. Marshall with Midtown says developers have often struggled to assemble parcels of land big enough to develop high-density projects. What’s more, he says, “the rapid increase in land values along Main Street has been another challenge.” When METRORail was initially completed in 2004, Midtown was still in its early stages of redevelopment. But as Midtown’s capital improvements started to have an effect, the market took notice, and land value along Main Street escalated quickly presenting additional risk for developers, he says. Ironically, one of the most blighted sections of Main Street may have the most promising future. Since planning for METRORail began, the area surrounding the recently shuttered Sears near the Wheeler/Blodgett Station has been marked as prime for a TOD. But Wulfe says assembling a viable tract has proven complicated for developers. Meanwhile, the area remains an underutilized eyesore, with a persistent homeless encampment under the Southwest Freeway and trash often strewn on the sidewalks and around the rail stop. Now, the Texas Department of Transportation’s plan to depress that section of the freeway could mean new opportunity. While the project will create complicated issues for mobility during construction, Young says now is the time to start planning to take advantage of the possibilities. “There is a complex set of opportunities that need to be addressed comprehensively and quickly so that positive effects can be maximized, and conversely that unintended negative consequences can be avoided,” she says. In fact, the site played a major role in one of the city’s biggest economic development bids in recent history. Houston was among dozens of cities that responded last year to Amazon’s call for proposals to build its $5 billion second headquarters. The local bid hinged in large part on what economic development officials dubbed the Innovation Corridor, a four-mile-long zone along Main Street stretching from Downtown to TMC that included a to-be-redeveloped Sears site owned by Rice University. Containing world-class universities, prime office space, research hubs and more, the Innovation Corridor made the case that Houston could compete for a high-tech, disruptive company like Amazon. When Amazon released its narrowed list of 20 potential cities in January, Houston didn’t make the cut. But officials were quick to point out the Innovation Corridor had legs beyond the Amazon bid. Thanks to the investments made along Main, the concept is likely to be used to lure other businesses to central Houston.